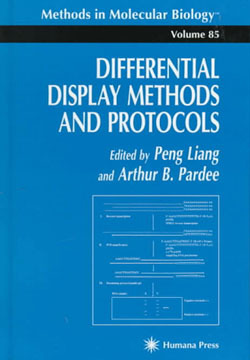 In Differential Display Methods and Protocols, Drs. Peng Liang and Arthur B. Pardee have for the first time assembled a comprehensive review of the state of the art of their powerful new methodology and its practical applications. The book's pioneering contributors describe all the major elements of this novel technology, including optimal primer designs, DD using fluorescence detection, cloning family-specific genes and major causes and solutions for false positives. Also provided are numerous examples, along with detailed experimental procedures, in which differentially expressed genes have been successfully identified in diverse biological systems ranging from plants to songbirds to humans. Comprehensive and on the cutting-edge, Differential Display Methods and Protocols provides readers with precise new tools for studying exactly how gene expression is regulated throughout the development of a living organism, and how the failure of this intricate control mechanism leads to pathological complications. This novel and productive methodology, fully detailed here is already playing a major role in the development of selective antagonists and inhibitors for treating cancer, cardiovascular disease, CNS disorders, and inflammation and tissue repair. Now scientists everywhere can successfully apply this powerful set of techniques using the step-by-step procedures of its innovators. The first book dedicated to differential display technology. Contains numerous step-by-step protocols and improvements by experts in the field. Discusses major avoidable causes for false positives. Includes applications from a wide range of biological systems from plants to animal brains. Offers suggestions for the future development of the technology. Treats all aspects of differential display for identifying and cloning differentially expressed genes. Presents numerous examples of successfully identified differentially expressed genes. Truly a road map for all those who are interested in differential display technology.